Tuberculosis (TB) is a major public health problem of global proportions. It is the second leading cause of death from an infectious agent, killing nearly two million people each year, mostly in developing countries. 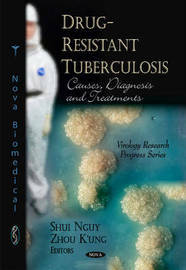 This book outlines the recent advances in the development of new multidrug-resistant tuberculosis (MDR-TB) drugs. The emergence of resistance to antituberculosis drugs, particularly of MDR-TB and newly XDR-TB has become a major health problem. This book provides some glimpses into the current drugs including their mechanism of action, side-effects and mechanism of resistance. The desirable features of new drugs is also discussed, as well as different targets for effective TB treatment and approaches that are being made in the development of potential drugs for resistant tuberculosis. The effectiveness of levofloxacin and olfoxacin in the treatment of multi-drug resistant tuberculosis is also comparatively assessed to determine the immunological effects of certain treatment regimens. Finally, this book expands upon the spectrum of potential resistance-related mutations in MTB clinical isolates to help consolidate the framework for the development of molecular methods for delineating the drug susceptibility profiles in clinical laboratories.